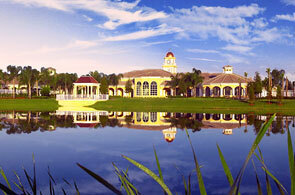 Lake Nona is designated to be a medical city and will be more than 600 acres Lake Nona Golf & Country Club, a private residential golf club community in southeast Orlando, Florida. The new Orlando Veterans Affairs Medical Center has been selected as the national site for medical simulation training. Medical simulation includes the latest medical simulation technology such as surgical robotics and simulated patients. It’s hoped to bring jobs and further kudos to the region. The 1.2 million square foot facility medical center will open in August 2012. To prepare for the opening, the center will collaborate with other medical facilities including University of Central Florida's College of Medicine, and the Sanford-Burnham Medical Research Institute. Previously known as the Burnham Institute for Medical Research, it is a non-profit medical research institute with locations in Orlando, Florida, La Jolla and Santa Barbara California. The Orlando VA Medical Center will serve the more than 400,000 veterans in Central Florida. University of Central Florida's College of Medicine welcomed its first 40 students in August 2009. The school's cost is $100 million medical campus. The M.D. program enrolled its second class of 60 students in August 2010 and will soon produce 120 medical graduates each year. The UCF Health Sciences Campus now includes the medical school's new 170,000-square-foot medical education facility, along with its new 198,000-square-foot Burnett Biomedical Sciences building. In May 2006 Orlando International Airport began the groundwork to development what could one day link the airport to the University of Central Florida medical school. Airport leaders see the medical school's appeal to research firms and other commercial ventures as a way to make money from undeveloped airport land. McCoy Air Force Base officially closed in 1975, and most of it is now part of the Orlando International Airport. The airport still retains the former Air Force Base airport code MCO. Whether you’re a first-time homebuyer, an empty nester or someone just looking for a home in the heart of the world’s most famous vacationland, there’s a design and a price range just for you at ChampionsGate. Lake Nona is designated to be a medical city and will be more than 600 acres Lake Nona Golf & Country Club, a private residential golf club community in southeast Orlando, Florida. Lake Nona is designated to be a medical city and will be more than 600 acres Lake Nona Golf & Country Club, a private residential golf club community in southeast Orlando, Florida. The new Orlando Veterans Affairs Medical Center has been selected as the national site for medical simulation training. Medical simulation includes the latest medical simulation technology such as surgical robotics and simulated patients. It’s hoped to bring jobs and further kudos to the region. The 1.2 million square foot facility medical center will open in August 2012. To prepare for the opening, the center will collaborate with other medical facilities including University of Central Florida's College of Medicine, and the Sanford-Burnham Medical Research Institute. Previously known as the Burnham Institute for Medical Research, it is a non-profit medical research institute with locations in Orlando, Florida, La Jolla and Santa Barbara California. The Orlando VA Medical Center will serve the more than 400,000 veterans in Central Florida. University of Central Florida's College of Medicine welcomed its first 40 students in August 2009. The school's cost is $100 million medical campus. The M.D. program enrolled its second class of 60 students in August 2010 and will soon produce 120 medical graduates each year. The UCF Health Sciences Campus now includes the medical school's new 170,000-square-foot medical education facility, along with its new 198,000-square-foot Burnett Biomedical Sciences building. In May 2006 Orlando International Airport began the groundwork to development what could one day link the airport to the University of Central Florida medical school. Airport leaders see the medical school's appeal to research firms and other commercial ventures as a way to make money from undeveloped airport land. McCoy Air Force Base officially closed in 1975, and most of it is now part of the Orlando International Airport. The airport still retains the former Air Force Base airport code MCO. Updated: 22nd April, 2019 5:14 AM.